Born: 15 November 1880, Prince Albert, Cape Colony, South Africa. Hendrik Johannes ("Harry") Neethling, agriculturalist, was educated at Victoria College, Stellenbosch, and passed the matriculation examination of the University of the Cape of Good Hope in 1899. In February 1901, during the Anglo-Boer War (1899-1902), he came to Bloemfontein, Orange River Colony (now the Free State), to take up an appointment as secretary to Sir H.J. Goold-Adams*, newly appointed lieutenant-governor of the colony. In 1903 he acted as interpreter to Joseph Chamberlain, British secretary of state for the colonies, during the latter's visit to South Africa. That same year he became manager of Grootvlei Experimental Farm (about 13 km south-east of Bloemfontein), until the end of 1904. 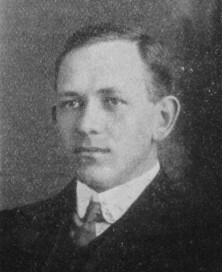 He then proceeded to Canada where he studied agriculture at the Ontario Agricultural College at Guelph, during 1905 and 1906. In October 1906 Neethling was appointed chief of the Biological Division of the Department of Agriculture of the Orange River Colony, stationed in Bloemfontein. The next year the divisions of Biology and Horticulture were combined under him, so that he had to deal with both plant diseases and insect pests. He gave up his position at the end of 1908 and thereafter farmed in the Senekal district. In 1907 Neethling became a member of the Philosophical Society of the Orange River Colony and served on its management committee during 1907/8 and 1908/9. During the same year he became a member also of the South African Ornithologists' Union and the South African Philosophical Society. He remained a member of the latter when it became the Royal Society of South Africa in 1908. Orange River Colony, Department of Agriculture. Report, 1906/7, 1907/8, 1908/9. Philosophical Society of the Orange River Colony. Transactions, 1903-1907, Vol. 1, lists of members and officers.